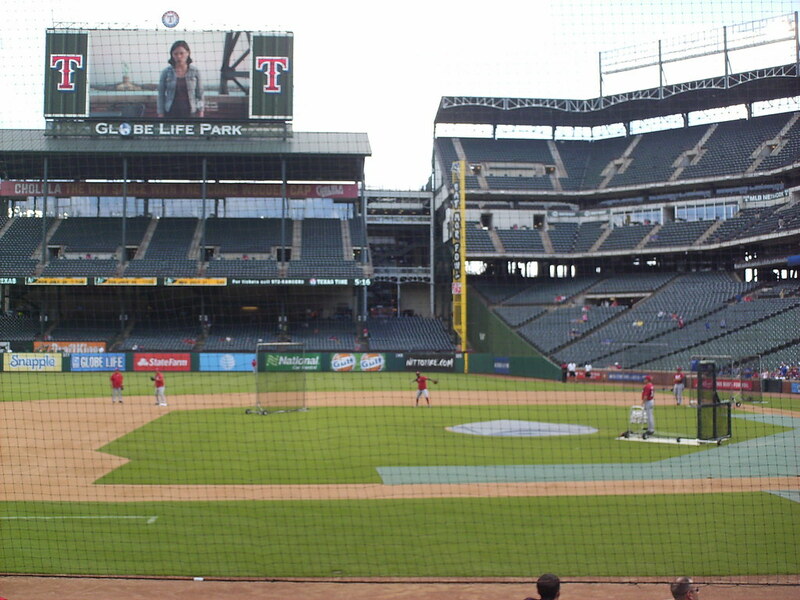 The view from behind home plate at Globe Life Park. 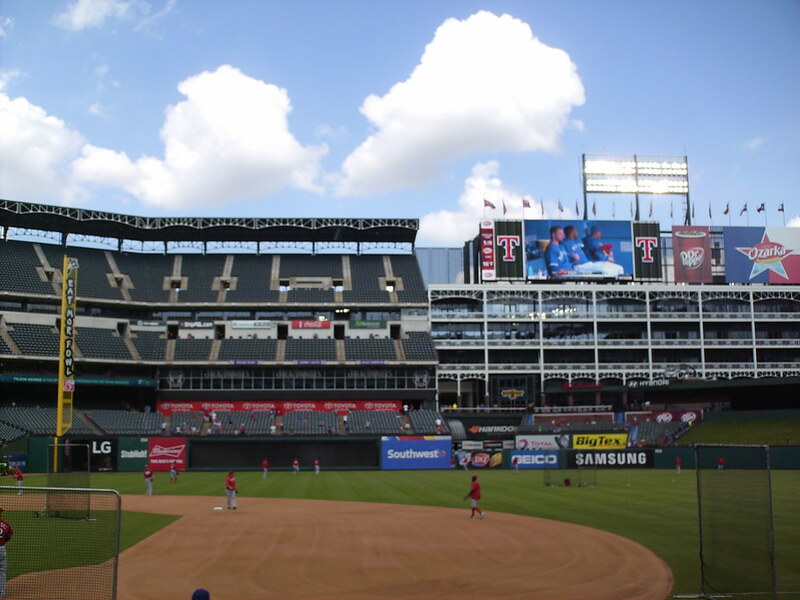 The grandstand at Globe Life Park in Arlington, as seen from center field. 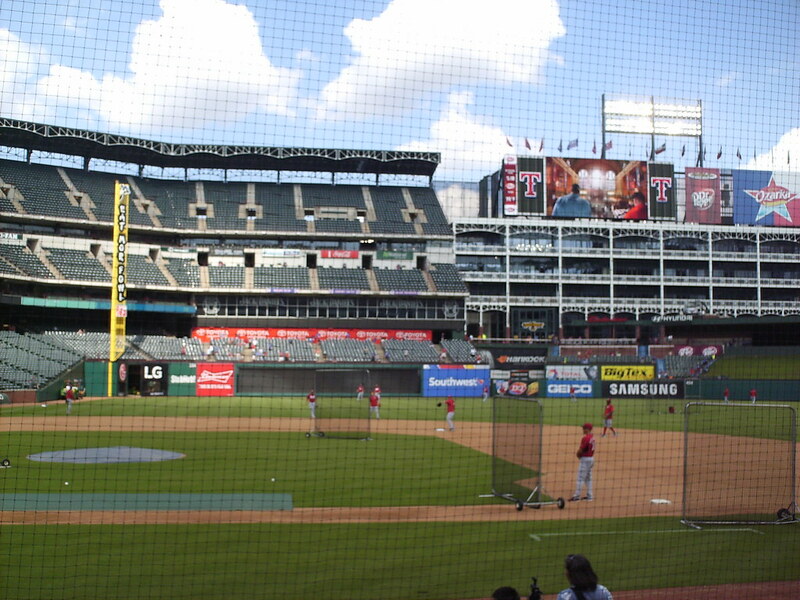 The pressbox sits on the second deck behind home plate. 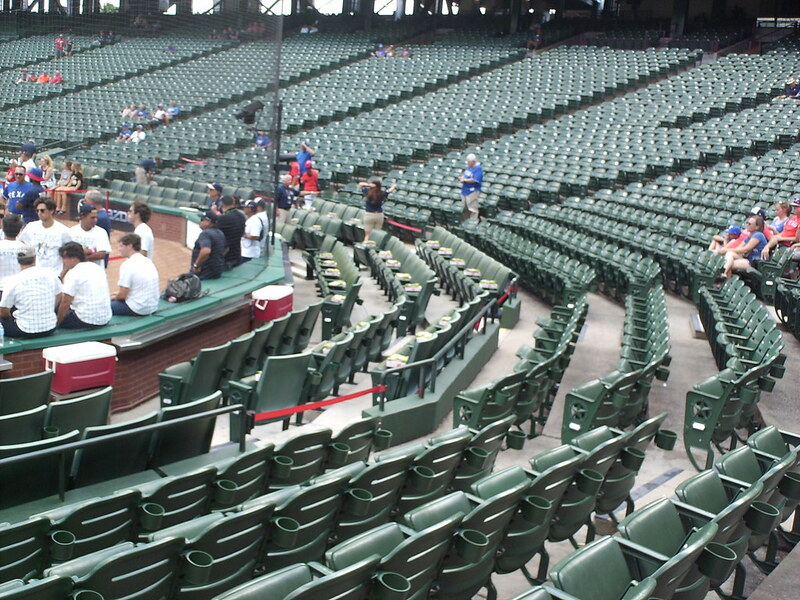 Padded seats with extra leg room make up the premium seating directly behind the backstop. 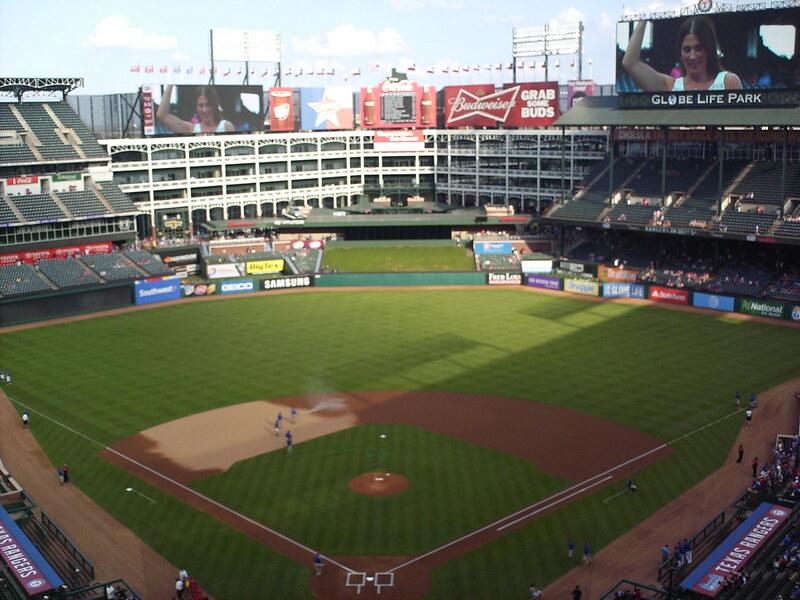 The seating bowl turns back to face home plate in the corners of the field. 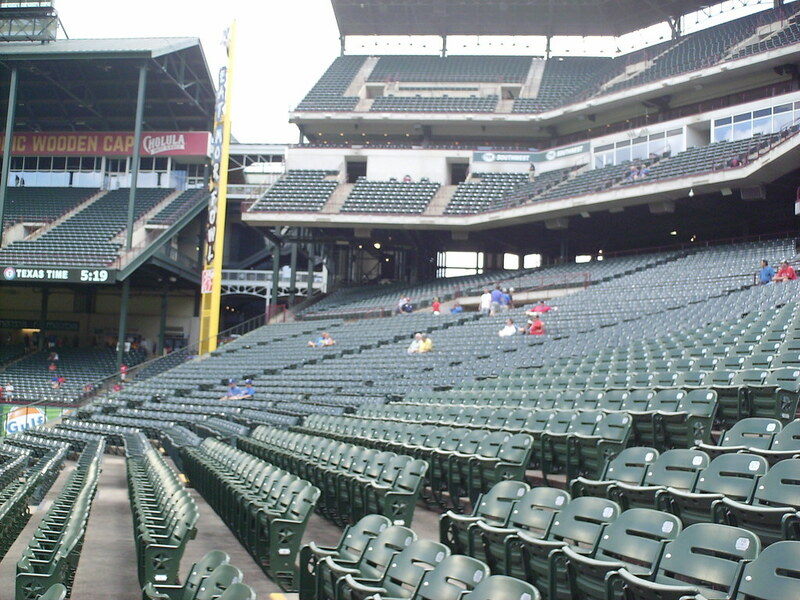 A covered bleacher seating section in right field evokes older, roofed ballparks like Tiger Stadium. 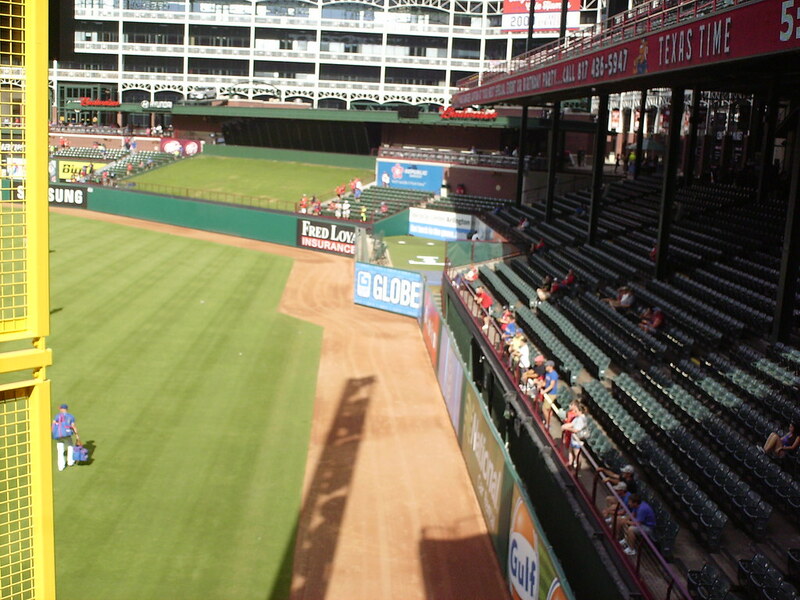 The left field corner of the park features an enclosed restaurant overlooking the outfield bleachers. 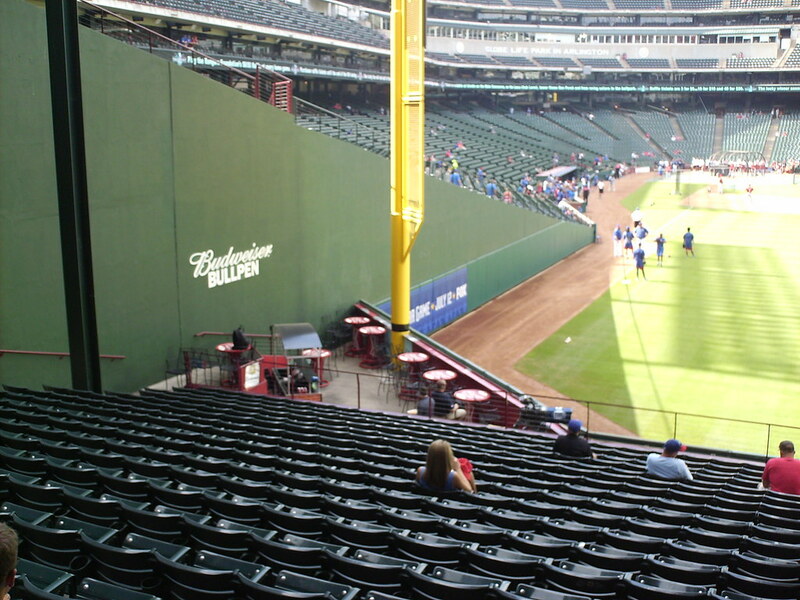 The right field wall runs very close to the foul line, and a small party porch overlooks the field from behind the foul pole. 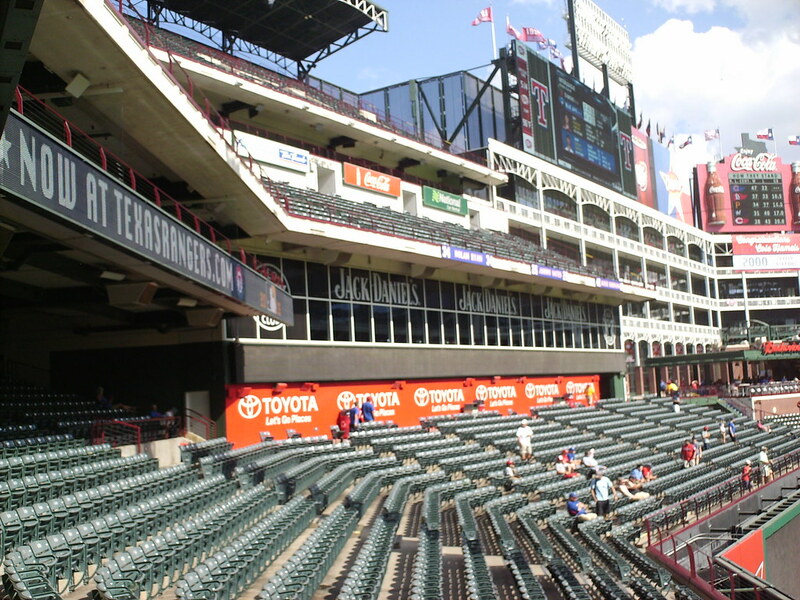 Globe Life Park features three decks of of seating, which wrap around the left field foul pole. 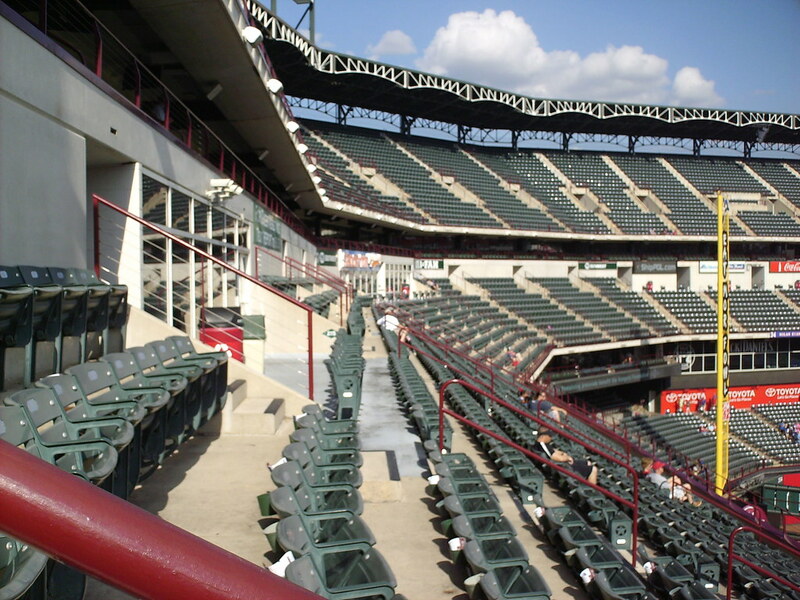 The second deck features suites behind home plate and several small bar areas scattered among the rest of the seating. 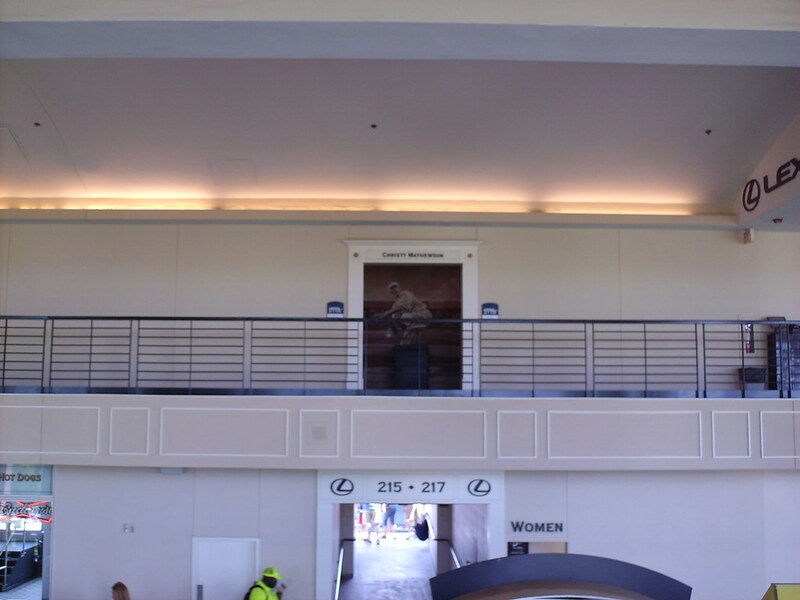 Entrances to the suites at Globe Life Park are named after Hall of Fame players and feature murals of the player they are named for. 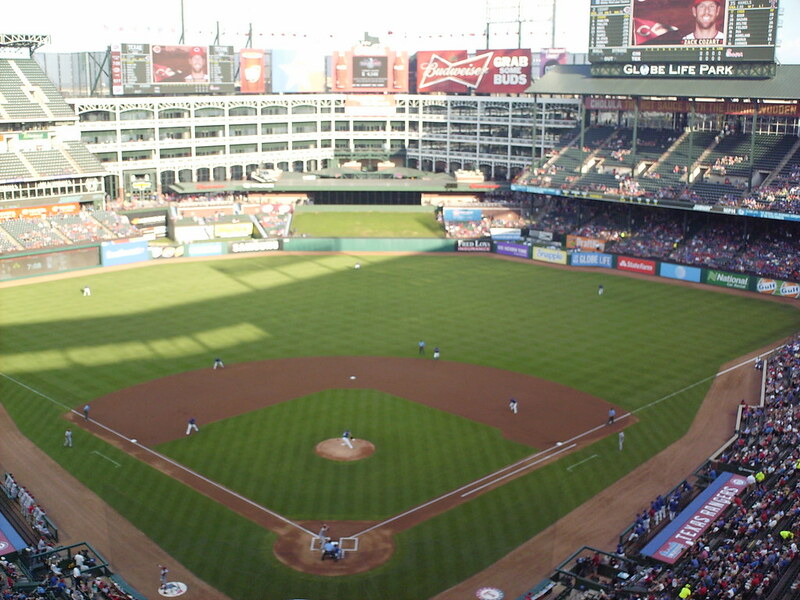 The view of the field from the upper deck. 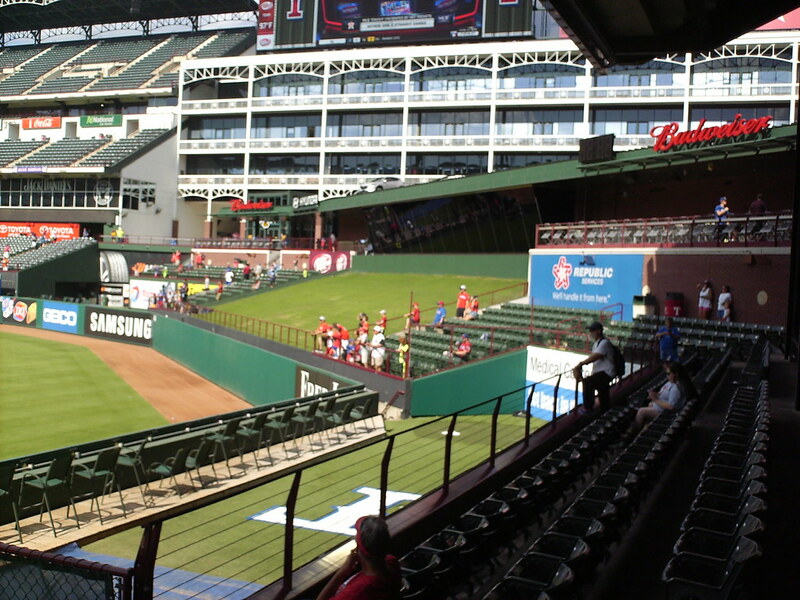 The bullpens are located on either side of the batter's eye and restaurant in center field and are surrounded by seating. 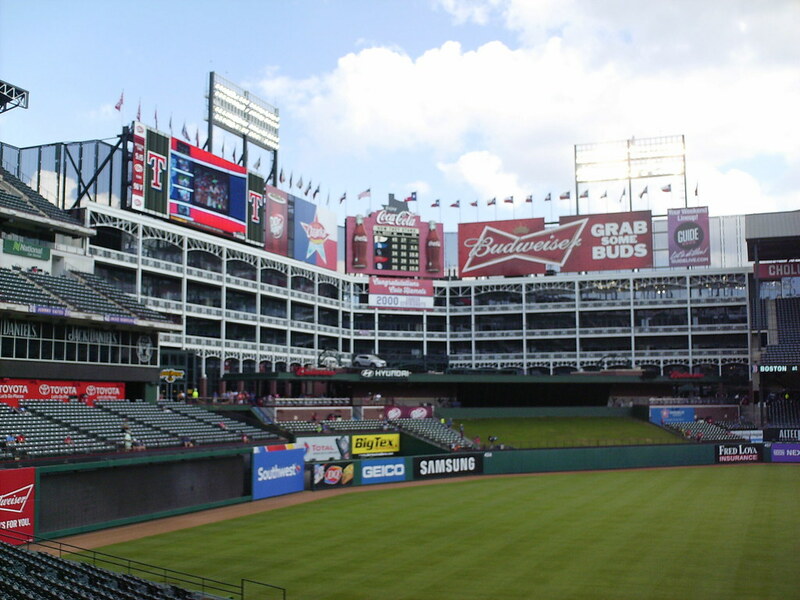 The stadium's outfield is enclosed by a large complex of office space, fronted by a distinctive white frieze. 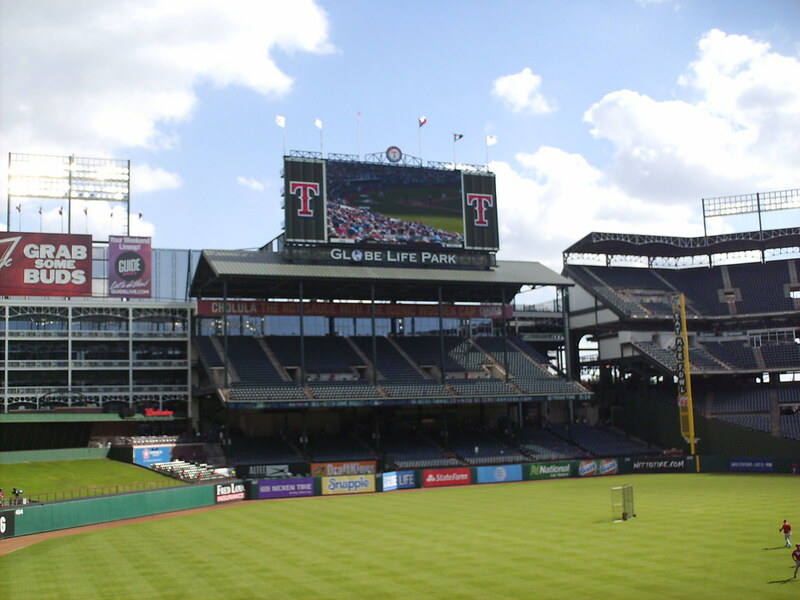 The park's original scoreboard sits in dead center field, with a video board on the left field side. 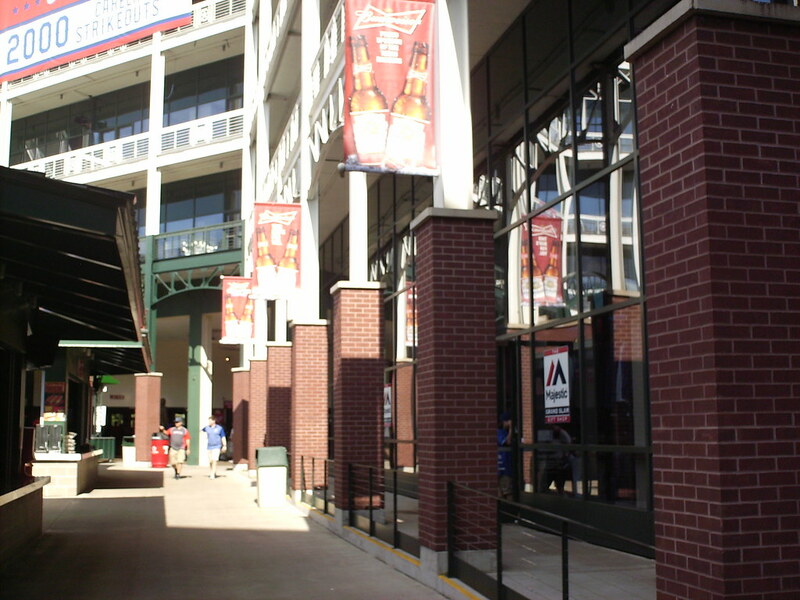 The concourse in center field features shops in the bottom of the office buildings, and concession stands behind the batter's eye restaurant. 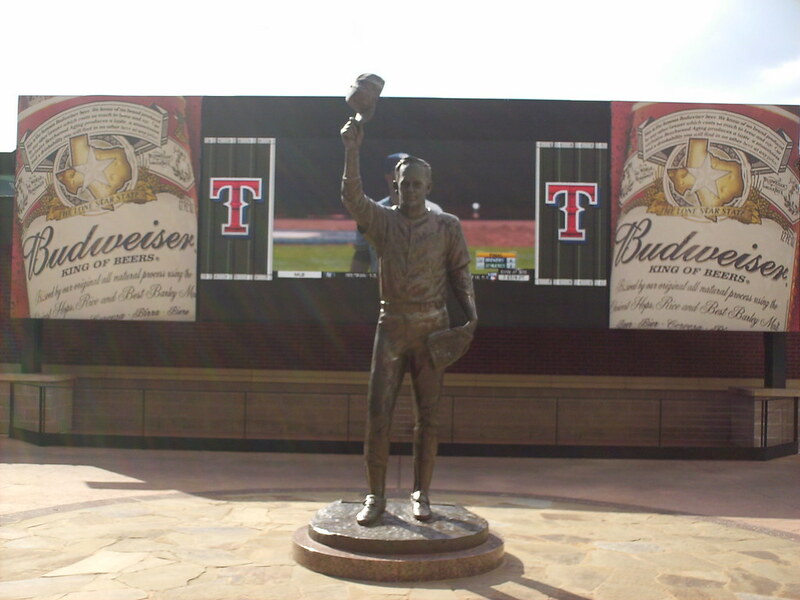 A statue of Nolan Ryan sits on the center field plaza. 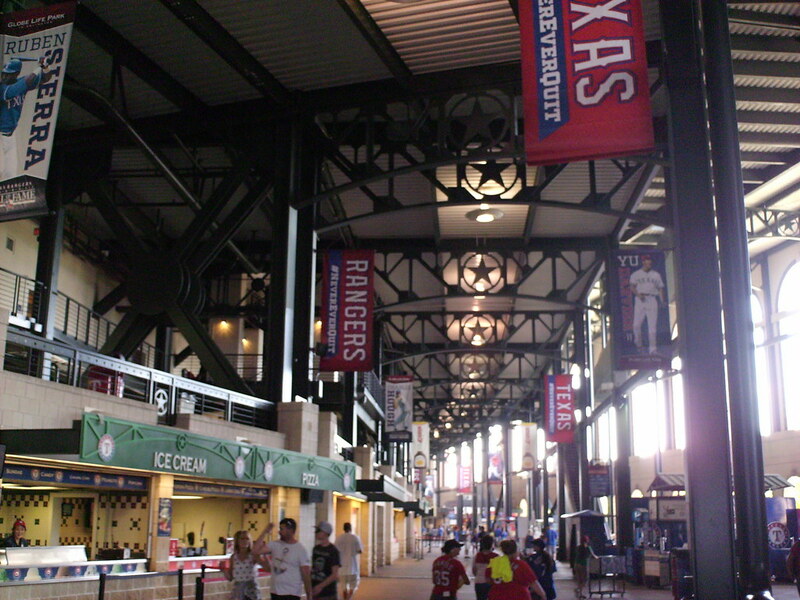 Banners along the large main concourse celebrate both current Texas Rangers as well as members of the team's Hall of Fame. 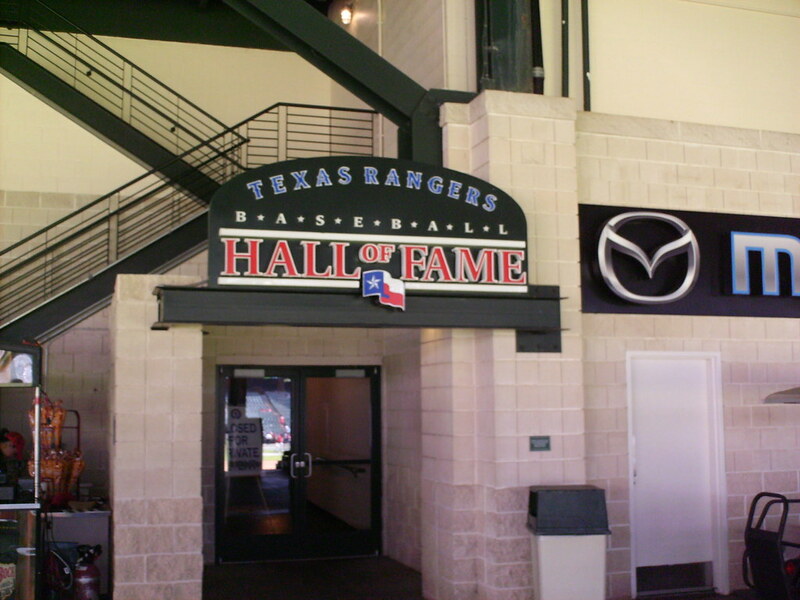 The Rangers Hall of Fame museum is located along the outfield concourse in right field. 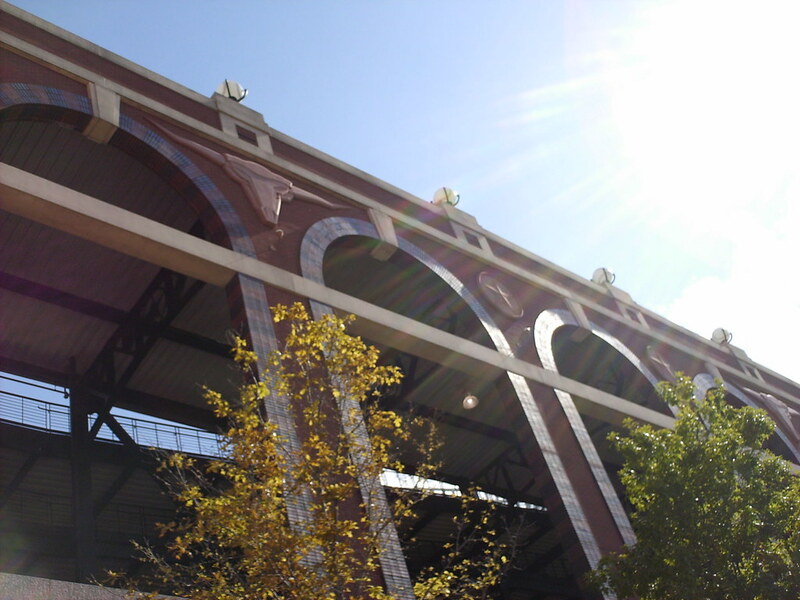 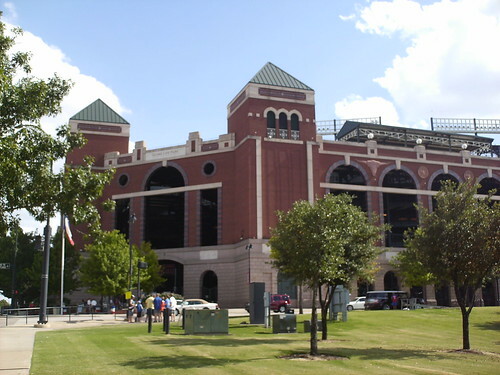 The stadium's exterior features brick archways and lots of Texas themed imagery. 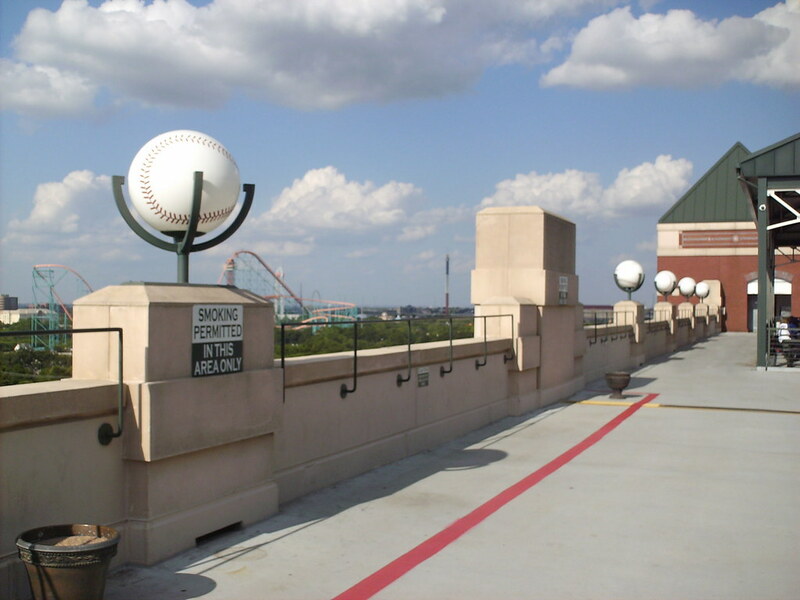 Baseball shaped lighting fixtures run along the edge of the rooftop. 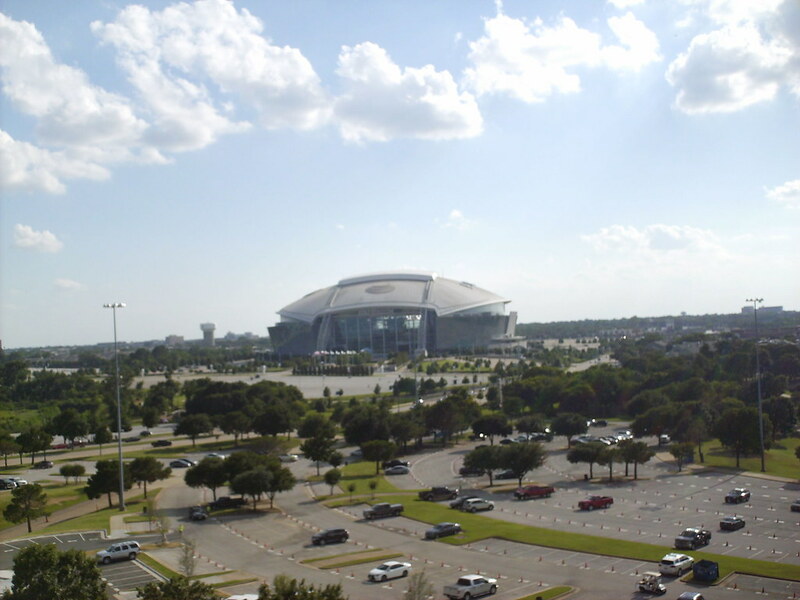 AT&T Stadium, home of the NFL's Dallas Cowboys, sits across the parking lot from Globe Life Park. 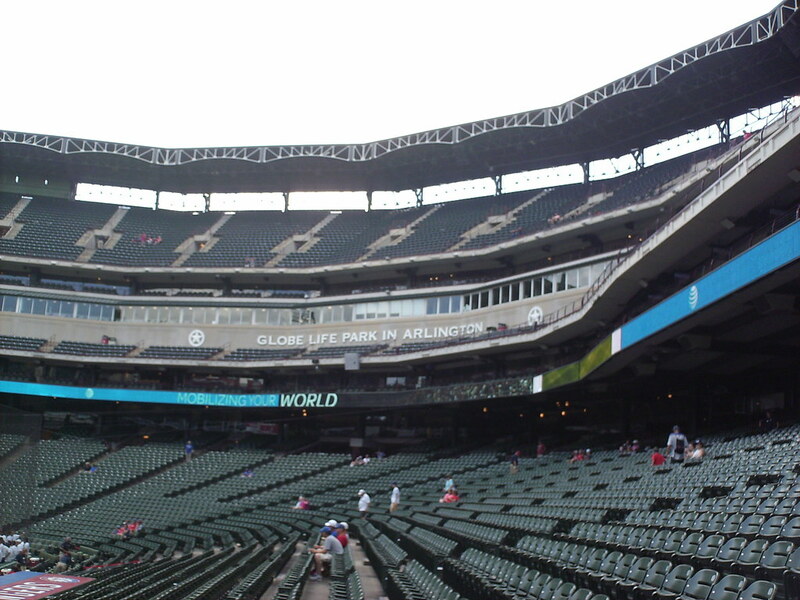 Horizontal lighting banks and a white frieze reminiscent of Yankee Stadium run around the edge of the roof. 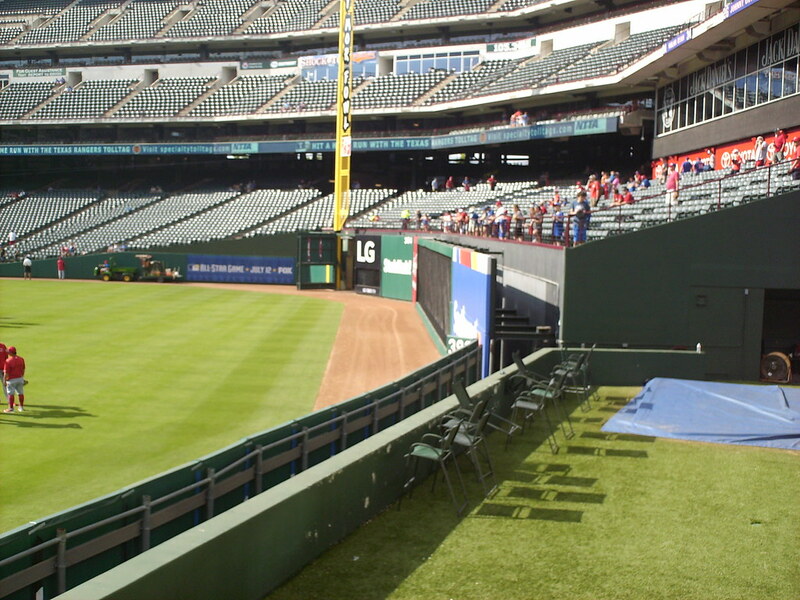 The outfield wall features several sharp corners and angles, especially where the bullpen pushes out onto the field in right field. 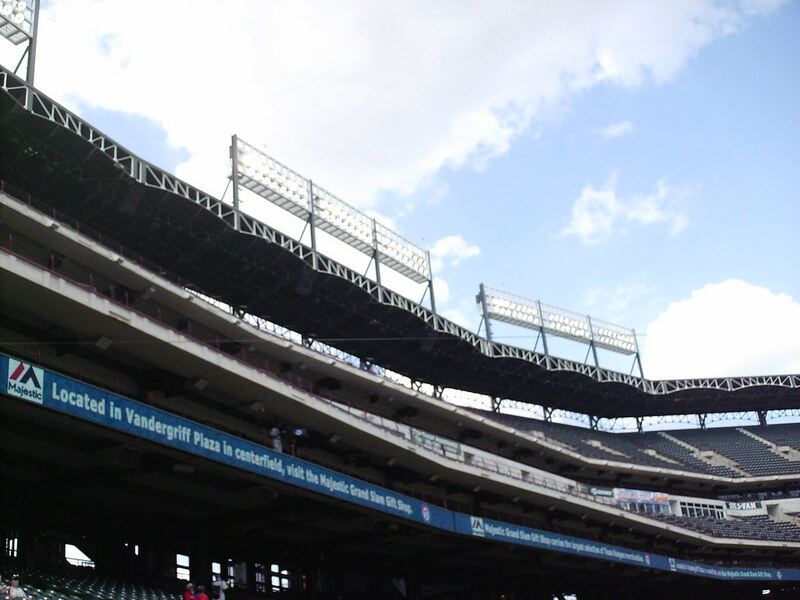 The left field wall features an out-of-town scoreboard like the one at Fenway Park, and is significantly taller than the rest of the fence. 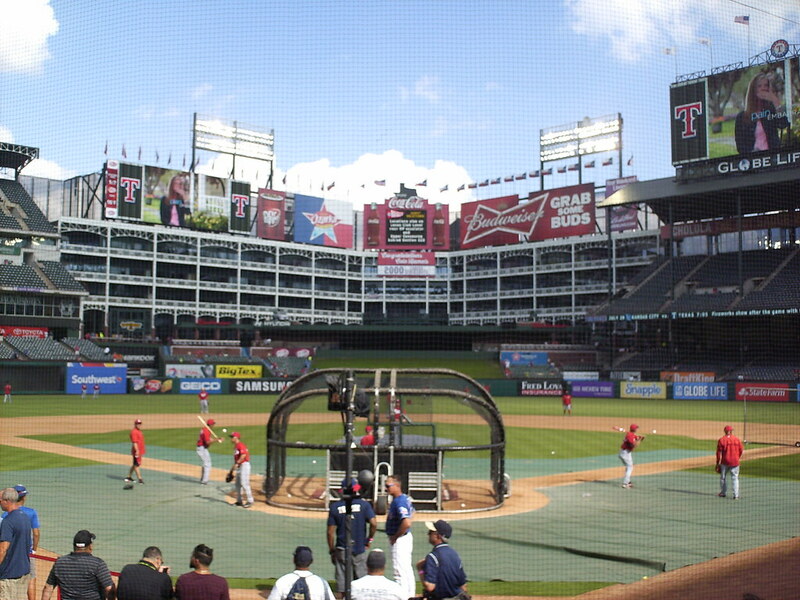 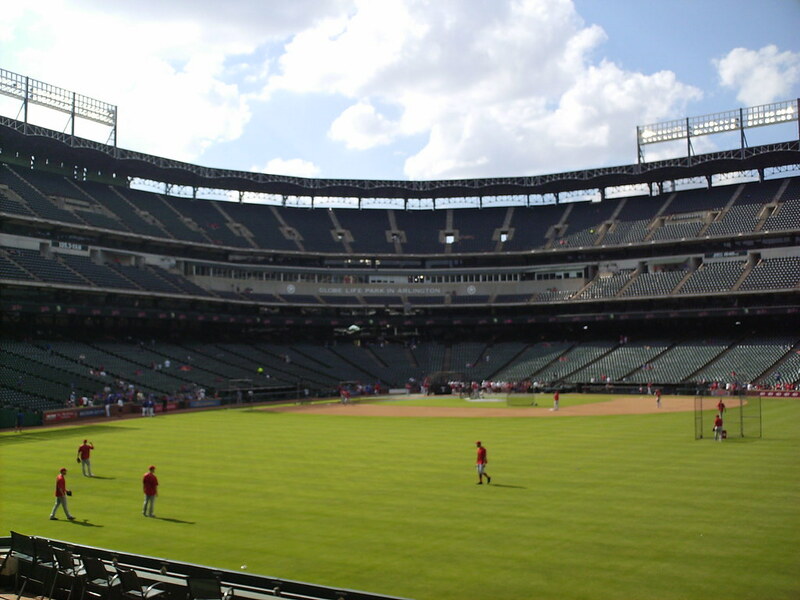 The Texas Rangers on the field during a game at Globe Life Park in Arlington.